This is Deryn a year ago! 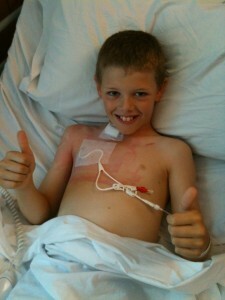 He was 10 when he was diagnosed with ALL on July 30th 2010. It hit us like a ton of bricks because Deryn wasn’t even that ill, his only symptom was a loss of appetite! When the Dr’s told us that we would be starting a 3 and a half year treatment plan, our hearts sank….that is forever! Deryn has been very lucky in his journey, he’s a text book case and has very few problems which is amazing. However, he’s not been without his problems. He got appendicitis in October and had to have a very dangerous surgical procedure, made dangerous by the fact his white cells were flat, his platelets were extremely low and his red cells were needing a transplant. I had to sign a form to allow the operation after being told that there was a high chance he would not make it through the op. He recovered within 8 days and 10 days after the op he was back at school! In December he developed pancreatitis which really set him back, he lost over a stone and missed out on Christmas, we had our Christmas on the 4th of January but it was the most amazing celebration ever. 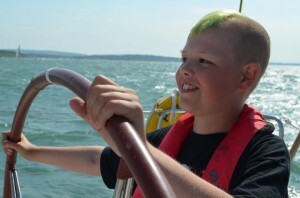 Deryn had to have a nose tube and had lost all his hair, this was probably the most difficult time as he looked ill and this was something he’d never wanted but it didn’t take him long to get the weight back on and the tube gone. He’s fought so bravely throughout this last year and has never let anything hold him back. He wasn’t able to attend school for 85% of the year but he still went to take his SATS and passed each and every one of them with top marks, he only got one question wrong! We are so immensely proud of our son and all he has overcome, he is an inspiration for us all. This is a picture of Deryn that was taken a couple of weeks ago. He went for a four day sailing trip with Dame Ellen MacArther. The pictures on the trip were taken exactly a year after the picture of Deryn in hospital. If someone had told us what Deryn would be doing just a year later we would have never believed them. I hope that Deryn can be an inspiration to many more throughout his journey. Not sure if my last post posted! How wonderful to see your gorgeous Deryn looking so well! My son Ashton also has ALL & is currently 6 months into maintenance treatment, so has just under 2 years left. I can’t wait to be able to show photos as fabulous as yours, your lad truly looks fabulous & I am thrilled he has finished his treatment – it’s such a long haul for them, isn’t it?